getcalc.com's Equivalent Resistance (Req) Calculator is an online electrical engineering tool to calculate resultant resistivity for 2 or more resistors connected in series or parallel. 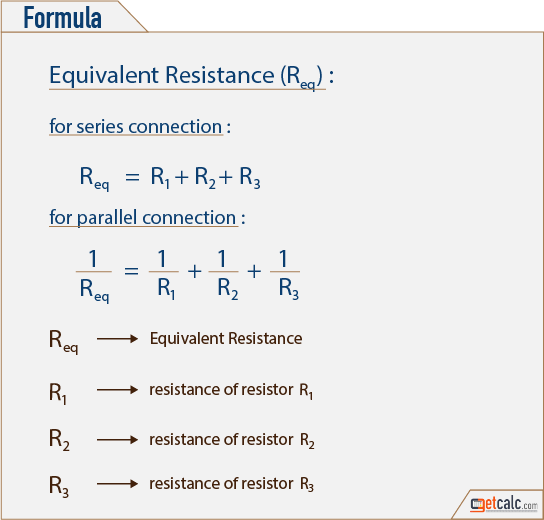 Equivalent Resistance, often abbreviated as Req in electrical engineering, is a measure of whole combined resistance of 2 or more resistors connected in series or parallel. A resistor is a two terminal electrical component that creates the resistance for the passage of current flow. The measurement unit for resistance is Ohms (&ohm;).